Hi! I`m very glad of join this website, I hope that my works will be useful for you!! 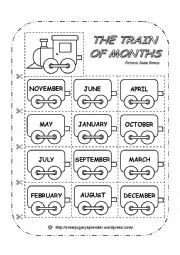 The children have to colour the train, cut the parts, give the correct order to the months and paste them on a new sheet of paper!!! I know you will like it! 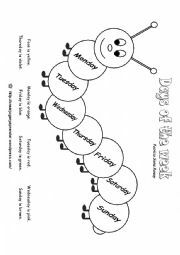 You can see also my worksheets "DAYS OF THE WEEK"
Ask the children to colour the pictures. Then cut by the pointed line and join all the parts with a stapler. Use two staples over the thin lines in the first page of the mini book. Your students will love it!! 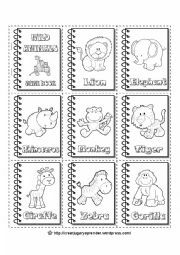 Ask the children to color the pictures. Then cut by the pointed line and join all the parts with a stapler. Use two staples over the thin lines in the first page of the mini book. 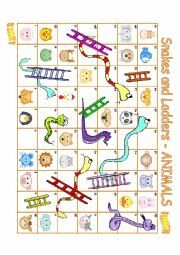 Your students will love it!. 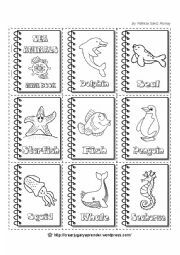 You can see also my mini books of animals. Part 3 of 3. There are two options for this worksheet. 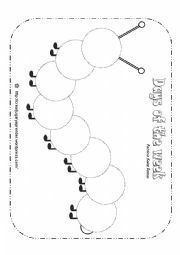 First one: Ask the children draw the face, write the days of the week in the correct order and color the whole caterpillar. Second one: use as a guide to paste the figures of part 2 of the worksheets. Your students will enjoy it!! 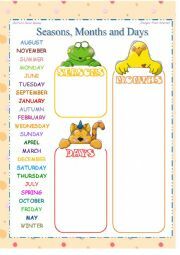 You can see also my worksheet "THE TRAIN OF MONTHS"
Part 1 of 3. In this one, children have to color the caterpillar following the sentences. Your students will love it!!! Part 2 of 3. Children have to color the parts of the caterpillar, cut, give them the correct order and paste. There are two options of doing this. 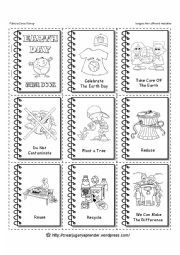 First one: use the part 3 of these worksheets as a guide. Second one: you can use a blank sheet of paper. In this case the children have to draw the antennae and legs.